The Ambassador of the Republic of Kazakhstan based in Islamabad Barlybay Sadykov, who presented his Credentials to the President on 07 November 2018, met with the State Minister for Foreign affairs Md. Shahriar Alam, MP at his office today. At the outset of the meeting, State Minister congratulated Ambassador Barlybay Sadykov upon his presentation of Credentials as Ambassador of Kazakhstan to Bangladesh. The State Minister mentioned that there exist multifaceted relations between Bangladesh and Kazakhstan which may be further deepened. Mentioning that Kazakhstan is registering excellent economic growth, the Kazakh Ambassador invited Bangladesh businessmen and entrepreneurs to visit Kazakhstan. 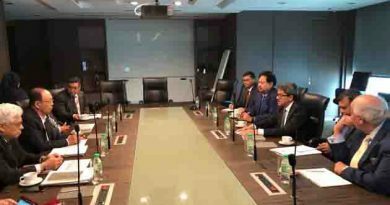 He informed that their government has established Astana International Financial Centre for enhancing trade cooperation and promote trade. He mentioned that Bangladesh and Kazakhstan maintains common position on important international and regional issues. He also referred to the role of CICA which has been established under the initiatives of Kazak government to which Bangladesh is a member. He extended thanks to Bangladesh for supporting in ASEM. He also mentioned that Kazakhstan is ready to extend support to Bangladesh candidature and causes in international fora and platforms. He lauded the role of Bangladesh in Peace Keeping operations. He mentioned that good cooperation exists between Bangladesh and Kazakhstan on defense areas. He stated that Bangladesh may share its experience in peace-keeping areas with Kazakhstan. The Kazak Ambassador also mentioned that Kazakhstan being a land-locked country requires to be connected to the other countries through land and sea routes and would explore the possibility of access to sea ports of Bangladesh. The Kazakh Ambassador then highlighted the importance of creation of Intergovernmental Commission between Bangladesh and Kazakhstan in order to identify and review the broad range of cooperation ranging from trade, economy, and investment to other sectors. State Minister lauded the outstanding development that has taken place in Kazakhstan. He particularly praised Kazakhstan’s contribution to regional peace and stability. Referring to the connectivity matter, he informed that Bangladesh looks forward to working with Kazakhstan in this regard. He proposed the Kazakh government to consider opening their Embassy in Dhaka. He briefed the Kazakh Ambassador about the tremendous achievement that Bangladesh has made during the last ten years under the leadership of present government. State Minister underlined the importance of frequent visits of politicians, people and businessmen. He also mentioned that Bangladesh and Kazakhstan working together in regional platforms like OIC, CICA and others. The Ambassador then informed that the Kazakh side would organize a Business Forum Meeting in Dhaka on Bangladesh-Kazakhstan trade and investment in December 2018. 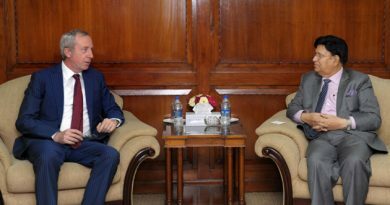 He also stated that cooperation may be established between Eurasian Economic Union and Bangladesh in order to facilitate trade and economic cooperation. State Minister at this point proposed that bilateral trades may be facilitated by according Free Trade Regime for Bangladesh under the aegis of Eurasian Economic Union. The Ambassador assured the State Minister of the consideration of the proposal of the Kazakh government. Foreign Secretary Mr. Md. 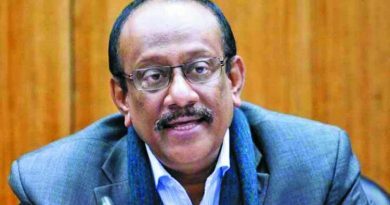 Shahidul Haque of the Ministry of Foreign Affairs has been promoted to the rank of Senior Secretary of the Government of Bangladesh.